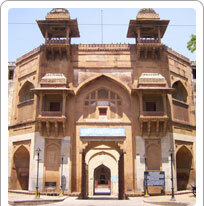 Magazine is the museum of the city of Ajmer. Its building was once a royal abode, the residence of Prince Salim, son of Emperor Akbar. Prince Salim later became Emperor Jehangir who read out his firman permitting trade to India by the British East India Company from this building. This very firman commenced the chain of events that eventually lead to the colonisation of India by the British. Armour and sculptures in both Rajput and Mughal styles are on view here.